With over 50 active ministries and groups, there’s something for everyone to get involved at our parish! Scroll through the ministries below, or use the navigation menu to select specific categories. Adult Faith Formation aims to faithfully witness and share the word of life about Christ so that Catholics can experience Christ more deeply in their faith in their daily journey. Through catechesis, we hope to nourish and strengthen adults so that they may enjoy a lifelong conversion while becoming more mature in their faith. Cursillo is a Spanish word that means "short course"; the full title for Cursillo means "Short Course in Christianity". The objective of the weekend is to learn to live what is essentially a Christian life in friendship with Christ, self, and others. It is a weekend experience that begins on Thursday evening and ends on Sunday night. There are separate weekends for women and men. The weekends are given each year in the Spring and Fall. St. Jane Parish Library, which is located across from the chapel, is a resource center for the parish. A large variety of religious books are available to nourish your spirit and enhance your formation as a Catholic. Videos and DVDs are also available to use for your family or prayer group discussions. The library is open during all weekend Masses, during Eucharistic Adoration on Tuesday from 9 a.m. to 9 p.m. and First Friday from 9 a.m. to 10 a.m. The RCIA (Rite of Christian Initiation of Adults) is a process whereby those interested in learning about the Catholic faith come together on a weekly basis to learn about the scriptures and the teachings of the Roman Catholic Church, and at the same time, to discover where God is present in their lives. The process is designed for those adults and children over the age of seven who are: Unbaptized; Baptized in another tradition; Baptized Catholic, but with no further religious training or sacraments. Here at St. Jane Parish, adult sessions meet on Thursday evenings from 7 to 9 p.m. Boy Scout troops have been active at St. Jane Parish for more than 60 years and accept boys ages 11-17 from within and outside the parish. There are meetings every Sunday evening from 6-7:30 p.m. in Father Farrell Hall. In addition, there are hiking and overnight camping trips. All Cub Scout Dens gather monthly for a Pack Meeting at Father Farrell Hall, usually on the third Friday of the month. Cub Pack 24, registered with Minsi Trails Council and the Boy Scouts of America, is chartered by St. Jane Parish and is open to all boys in the Community. The philosophy and major goal of the Parish Religious Education Program (PREP), sometimes refered to as CCD, is to assist parents in teaching our youth to know, to love and to serve God. The Parish Religious Education Program (CCD) consists of a Grades 1-6 Program and the 7th & 8th Program. Your children, regardless of the school they attend, are welcome to participate in the numerous social, cultural, and sports activities our CYO offers. A declamation contest, spelling bee, and a one-act play are some of the cultural activities offered. The fall sports include soccer, cross country and flag football. Winter brings basketball, and cheer leading. Spring offers soccer, track, softball, tee ball and baseball. All St. Jane parishioners and their children are welcome! Girl Scouts have been meeting biweekly from September through May. One week, the girls who are in grades K-6th, the Daises (5-6), Brownies (6-8), and Junior Girl Scouts (8-11) meet from 6 p.m. to 7:30 p.m. or 8 p.m.
On alternate weeks, the 7-12th graders, the Cadets and Senior Girl Scouts (11-17) meet from 6 p.m. to 9 p.m. A summer trip is usually scheduled for the older girls. During the school year, we meet on select Monday mornings in the Monsignor Gobitas Meeting Room from 10:30 a.m. until 12:00 p.m.
We also regularly schedule convenient opportunities for moms to spend prayerful time before the Blessed Sacrament in Adoration; to participate in the sacrament of Reconciliation; and to pray the Rosary as a group each month. Evening book club, Bible study meetings, and periodic family nights offer great discussions and impactful insights for all involved – particularly for moms who might not have daytime availability during the week. In the summer, we meet weekly at various local parks, playgrounds, and points of interest. The Rite of Christian Initiation of Adults adapted for children is a process during which the children meet in small groups as they begin to discover their personal relationship with God. The children follow the stages of Inquiry, Catechumenate and Lent. This preparation culminates with their full initiation into the Church at the Easter Vigil. This is usually a two-year process. St. Jane Frances de Chantal School is a complete elementary school with classes from Kindergarten through eighth grade. The campus is at 19th street and Washington Blvd. in Wilson Boro. The school advances the mission of the Catholic Church by following a God-centered curriculum with the emphasis on basic skills, paralleled with current advances in education and technology, and implemented by dedicated teachers with supportive parents and parishioners in a loving, disciplined family atmosphere. The junior high youth group, which is open to all 7th and 8th graders in the parish, is a fun community which helps youth grow in their faith journey. Along with prayer, worship and building a community, they provide service to the community. The youth group usually meet monthly. The senior high school youth group offers all parish teens in grades 9-12, the opportunity to experience a variety of activities within the context of the Catholic faith. Meetings are usually held on the first and third Sundays of every month during the school cycle from 7-9 p.m. in the Monsignor Gobitas room. In addition to the monthly meetings, the group participates in activities such as an annual Retreat run by the teens, Holy Thursday Church hopping, Movie/Games Nights, community service by serving lunch at Safe Harbor, etc. Adult Altar Servers serve at funerals, Holy Day Masses, and other liturgies as needed. This special ministry is responsible for preparing our worship space for Liturgical Celebrations with signs and symbols deeply rooted in our Faith. Placement of flowers, plants, paintings, etc. is the responsibility of this ministry. Extraordinary Ministers of Holy Communion have the honor, and great responsibility of assisting with the distribution of Holy Communion at Mass, and/or bringing Holy Communion to the sick and infirmed at their homes, hospitals, and area nursing homes. Training sessions are usually held during the summer months. The Greeter invites all to enter into the House of the Lord and is called to set an example of hospitality for the rest of the community. Greeters are the initiators of a climate of hospitality, on Sundays and special occasions, that should spread throughout the whole church community. A lector is responsible for proclaiming the word of God in a way that makes the word come alive. Proclaiming is transmitting the scripture in a public, articulate, and interpretive manner. The word of God is multi-faceted. It teaches converts, forgives, challenges, encourages, and sustains the faithful. The ministry schedule includes all of those who assist at Liturgies as Altar Servers, Extraordinary Ministers of the Eucharist, Lectors, and Cantors. The role of the music ministry is to lead congregational singing and support and enhance the liturgy with music for meditation. We have an adult choir, contemporary choir, children's choir (angel choir), cantors, and instrumentalists. Members are Catholic men and women: married, single, separated, who share in our spirituality, charism and apostolic mission. They are willing to strive for perfection and cannot be living directly opposed to the Ten Commandments or Precepts of the Church. They are distinguished by a great devotion to the Holy Eucharist. The St. Jane's men's fellowship group meet the second and fourth Saturday at 7:30a.m. We also meet on the third Sat. for breakfast. We are always looking forward to new brothers joining our group. The Divine Mercy Ministry at St Jane Parish promotes devotion to the eternally generous mercy of God. The chaplet is recited every Tuesday, at 3:00 p.m., during Eucharist Adoration in the chapel. It is also recited every Saturday morning after 9:00 a.m. Mass, for the intentions of all those struggling with cancer. Divine Mercy Sunday is celebrated on the first Sunday after Easter. For those seeking special quiet time in the presence of the Blessed Sacrament, Tuesday beginning after the 8:15 a.m. Holy Mass and closing with Benediction at 9:00 p.m. At 3:00 p.m., the Divine Mercy Chaplet is prayed. The Miraculous Medal Novena is prayed at 7:00 p.m. The Marian Prayer Group meeting consists of a hymn, scripture reading, prayer intentions, the Rosary and a discussion or witness sharing and occasional guest speakers. Join us for prayer in the chapel, on the 2nd and 4th Wednesday of the month from 7 p.m. to 8:30 p.m.
Our parish retreat is a weekend away spent with Our Lord. It is run by our fellow parishioners and one of our priests, who serves as a spiritual director. It is a time for private prayer, listening to talks and discussions. The main focus of this once in a lifetime experience is to bring parishioners closer to Christ while also strengthening the community of our parish. It is usually held the first weekend in March. The visitation of the Pilgrim Statues Program began at St. Jane’s in 1986. The statues of Mary, depicting Our Lady of Fatima, were carved from wood in Fatima, Portugal. The statues travel weekly to different homes in the parish to encourage devotion to the Blessed Mother. Our group is a Charismatic Group, whose members are apart of the Diocese of Allentown. We are supported by a larger community known as Bukas-Loob Sa Diyos Covenant Community of the Archdiocese of Newark, New Jersey. 1st Friday - 7:30p.m. Teachings / Instructions / Workshops @ Msgr. Gobitas Room. 2nd & 4th Fridays - 7:30p.m. Praise & Worship + Word Sharing Circles @ the Chapel. 3rd Friday - 7:30p.m. Confessions followed by Healing Mass, officiated by Fr. Cliff Bishop @ the Chapel. We always start with the Holy Rosary. Once or twice a year we sponsor a Life in the Spirit Seminar. Repair with Care can provide enrichment, healing and mutual support in a structured bereavement program for people who are experiencing the death of a marriage. The program addresses the multiple stages of grieving and provides useful tools to assist people in moving through the grieving process. At St Jane’s, we meet twice a year for 12 sessions each, beginning in September and February. The program is open to anyone in the community. The opportunity to pray a traditional Catholic prayer, the Rosary, is provided to the residents at the Old Orchard Manor Care at 4100 Freemansburg Ave, Easton on Mondays. The rosary is recited every Wednesday at Eastwood Care Center on Fairview Avenue. The rosary is recited at Arden Courts Memory Care, 4098 Freemansburg Av., Easton on the 3rd Wednesday of each month at 2PM. One volunteer leads the Rosary for the residents each week. The commitment to help in this ministry is approximately once every six weeks. Parishioners are involved in calling families of prisoners, putting up a tree decorated with angels that have lists of Christmas gift requests for children of prisoners, sorting the gifts and delivering them. A committee member visits the bereaved family to help them plan the funeral liturgy. Booklets are provided with suggested readings (Old and New Testament, and Gospel) and hymns to make the Eucharistic Celebration more meaningful to the family members of the deceased. Family members are offered the opportunity to participate in various areas of the Liturgy. The committee member will also explain what will happen during the Liturgy. The Cancer Support Group ministers to cancer patients, survivors, and families. The meetings are held on the second Tuesday of each month from 7:00 - 8:30 p.m. in the Monsignor Gobitas Meeting Room. They include professional presentations, prayer teams, small group sharing, and spiritual direction. The pantry, an agency of Second Harvest, provides food and clothing to our neighbors who are in need. It is located at 841 Washington Street in Easton (the former Easton Catholic Elementary School) and is open on the 1st and 3rd Tuesday of each month from 6 to 7:30 PM. A collection to help stock the pantry is held on the weekend of the last Sunday of each month. Please bring your items to church at that time and leave them on the table near the Bride’s Room. About 120 volunteers from the three Easton Catholic Churches (St. Anthony, Our Lady of Mercy, and St. Jane Frances de Chantal) support the pantry, however, there is an on-going need for volunteers to help in the distribution of food and other related tasks. The Society of Saint Vincent de Paul is an international lay Catholic charitable organization inspired by gospel values that is present in 142 countries of the world. At St. Jane Parish, we learn of those who need temporary, emergency assistance through phone calls and referrals. Members of the Society visit them in their homes to discuss their needs. These needs are then presented to the board for approval. Our funds come from the donations placed in the charitable boxes in the rear of the church and from direct donations from parishioners. All money received is used for the needy. This program is a simple and practical way to help the parish earn money. Simply purchase gift certificates to use when doing your grocery shopping or gift buying. The certificates (which are used like cash) can be purchased at weekend Masses or at the parish office, or school during the week. St. Jane receives from 2% to 10% of your total purchase cost. A list of all gift certificates available will be published periodically in the Church bulletin. Emergency meals are organized by parishioners in order to help families who are experiencing difficulties, deaths, tragedies, transitions and crisis. The Health and Wellness Committee provides holistic care to St. Jane’s community through education, health screening and contact with health care resources. Parishioners work in teams of 4-6 and serve meals at two homeless shelters—Safe Harbor in Easton and Victory House in South Bethlehem each month. They heat and serve the meals to the residents and then sit and eat with them and listen to their stories. We have homebound elderly and ill parishioners who need our love and attention. They are looking for someone to visit with them, talk with them, read to them, smile at them and give them unconditional love. We encourage each parishioner of St. Jane’s family to understand, embrace and promote reverence for the dignity and sanctity of all human life from conception to natural death: preborn, the disabled, the elderly, the sick, the dying and the condemned. Invitations to a Parish Coffee are extended via the bulletin, announcements at Mass and personal phone calls, by the committee, to each new household. Parish Coffees are held quarterly (usually the first Sunday of February, May, August, and November) in the Msgr. Gobitas Meeting Room, following the Noon Mass. Circle of Friends is a social club for Widows and Widowers to make new friends after the loss of a spouse. We meet the first Wednesday of every month from 7:00 - 9:00 p.m. in the Monsignor Gobitas Meeting Room (MGMR). All Widows and Widowers are welcome to join us each month for planned activities. St. Jane Home and School Association is a vital link between St. Jane School, the home and the parish. Its primary functions are to provide volunteers and raise money for the school. Volunteers are needed to assist at the school and its many activities. Various committees are responsible for much of the fund raising needed to help keep tuition affordable. The Knights of Columbus is a Catholic family, fraternal and service organization dedicated to the principles of Charity, Unity, Fraternity and Patriotism. The Knights was formed to offer aid and assistance to sick, disabled and needy members and their families. To be eligible to join, you must be a Catholic male who is at least 18 years of age and in communion with the Church. At St Jane Parish, Knights belong to Union Council #345 and meet on the 2nd and 4th Wednesday of the month in the Monsignor Gobitas room. Everyone interested in quilting ----non-sewers anxious to learn, or those who are thoroughly experienced in this creative skill ---- are invited to join the Piecemaker’s Quilting Group. This group brings together women of various walks of life to enjoy designing and sewing quilted creations as a fundraiser for parish activities. It is a source of joyful fellowship and fun activities, meeting on Thursday mornings at 10:00 a.m. in the Monsignor Gobitas Meeting Room. Do you knit or crochet? The Prayer Shawl Ministry welcomes your talents to knit or crochet shawls/lap robes for distribution to home-bound/hospitalized parishioners and those undergoing medical procedures (chemotherapy, dialysis, etc.) or anyone desiring the healing comfort of our Lord's arms. We supply yarn and patterns. We meet the second Tuesday of the month from 10:00 a.m. to Noon in the Monsignor Gobitas Meeting Room. The vocation committee implements ways to foster, affirm, educate, invite, and support those called by God to carry out the mission of Christ in serving the church as Priests, Sisters, Deacons, and Religious. The goal of the committee is to faithfully serve and glorify God through our Parish Vocation Ministry as directed by our Pastor for the promotion of religious vocations. The primary purpose of the society is to share and celebrate the rich Polish Catholic heritage with the rest of St. Jane Parish, with special consideration and devotion to our beloved Saint John Paul II. This group meets on the last Tuesday of the month in the St. Jane Church conference room starting at 7:30 p.m. Anyone interested in sharing Polish customs, traditions and folklore is welcome. 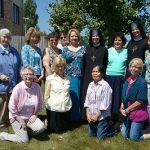 Women parishioners of all ages and backgrounds are invited to join this group where they can share their skills, talents and gifts from the Lord. We meet in the Msgr. Gobitas Room on the 3rd Tuesday of each month, except during the summer. For the convenience of our members, we have 2 meetings, one at 1:15 p.m. and another at 7:00 p.m. Meetings begin with the rosary.